The guttering of your home is a very important part of your roofing system, yet it also the chore that many homeowners leave off while mowing the lawn, weeding in the garden or painting the front door, for example. This is because these are things that can be seen, cleaning your gutter won’t be a huge improvement to the look of your house. However getting your gutter cleaned can make a massive impact on your wallet in the future. The guttering of your home allows rainwater to flow from your roof to the drain, if the gutter is clean, free of blockages and debris then your home is protected from dampness or damage. If the gutter is not cleaned and the gutter becomes blocked then extensive repairs may be required to your guttering, roof or property and this can be expensive. It is highly recommended that you book a UK gutter cleaning service to keep your gutter clean and your property protected. We are able to offer homes and businesses in the UK seasonal gutter cleaning service which ensures autumn leaves, twigs dirt and debris in winter, buds in spring and petals in summer do not block your gutter and cause damage to your roofing system or property. Here at Guttering Repairs we can arrange for an expert UK gutter cleaning specialist to come and maintain, repair and clean your gutter by hand, unblocking debris and blockages and ensuring the free flow of rain water along the gutter to the drain. It is highly recommended that you get your gutter cleaned at least once a year or twice if your property is surrounded by overhanging or large trees. 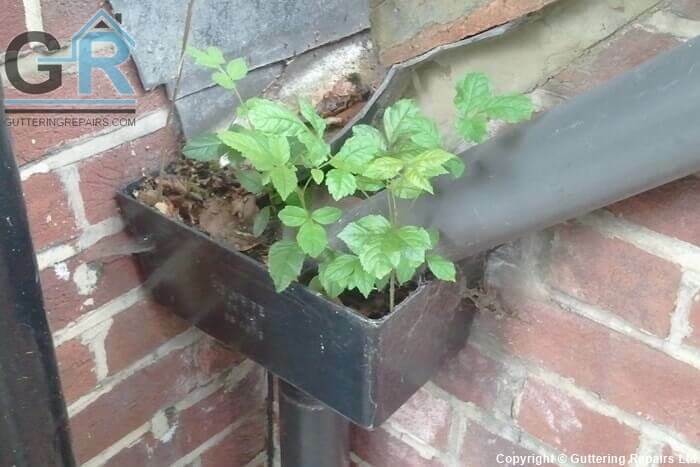 If your gutter is not cleaned annually damage can be caused to the gutter, dampness can affect the home and gardens or flower beds near the gutter can be destroyed. If you would like to stop unnecessary costly water damage then contact us now to book your UK gutter cleaning service.